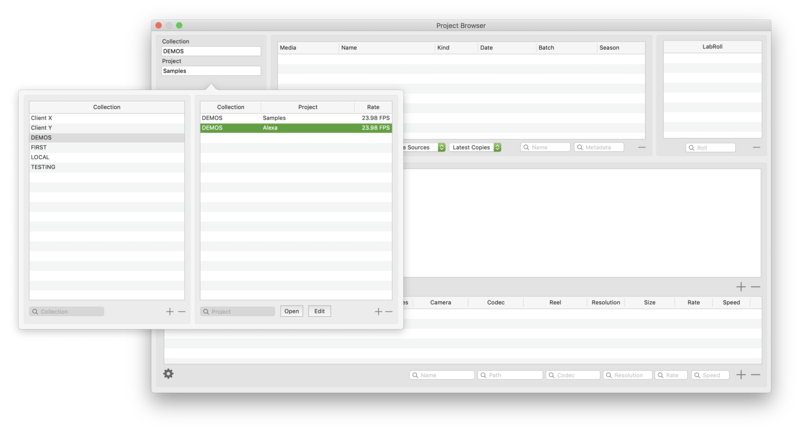 Click the book icon at the bottom of the main panel to open the Project Browser. Click in the top left on the Collection and Project information to see all your Collections and Projects. Collections are a group of Projects. Collections names could be clients, years, type of work or there can be just one collection for all projects. Select a collection, double click a project or select a project and click Open. The Media table at the top shows three kinds of media snapshots. The Media browser in the middle shows a Finder style view of the folders and files on the selected media. Use it to navigate around tapes and drives that are offline. 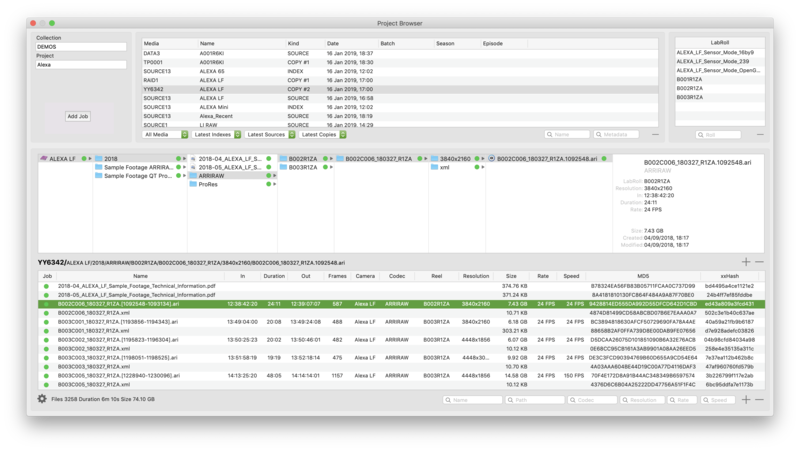 The File table in the middle shows metadata for all files selected in the Media Browser. 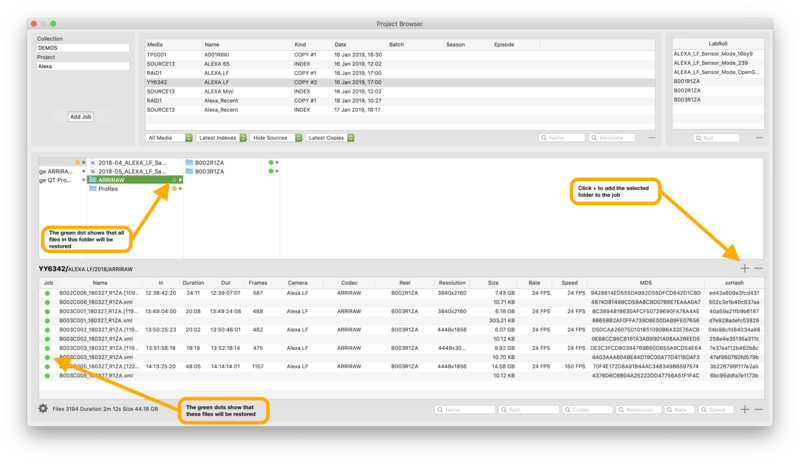 Use it to navigate around the snapshots of archived tapes and drives. The media does not have to be online at this point. Both the Media browser and the File table have + and - buttons. Use these to choose which files are restored. Select a snapshot and check that it has the files you want to restore. If restoring from drive or a shared volume ensure that it is mounted. If restoring from tape load the tape into a standalone drive. Or load tapes into an LTO library. No need to mount the tape. Then click Add Restore Job. If the source is not online then no job will be created. This snapshot is part of a job that archived the ALEXA LF folder to a RAID1 and to an LTFS tape YY6342. COPY #2 includes the files copied to YY6342. SOURCE snapshots are useful to see where files came from. However when the job completes they would probably have been erased, so they are not needed when restoring. Select Hide Sources so they are hidden in the Media table. If files have been added or removed from a drive or tape and it is indexed again, then another snapshot will be created with a new time and date. Selecting All Indexes/Sources/Copies will show the history for particular media. After clicking Add Restore Job if there is a preset called RESTORE, this will be automatically recalled to setup the paths and reports. Click Edit Paths to adjust the destination paths and setup any required reports. Click the start button to restore all the ALEXA LF files from the tape. By default all files in the selected Media snapshot are included. This time we only want to restore some files so ensure the base folder is selected in the Media browser and then click the - button at the right of the Media browser. The green dots will disappear next to every file and folder. If alt/option is held down whilst clicking the + or - then all files will be added or removed from the job regardless of the items selected in the browser. Choose a folder in the Media browser, select some files for restore. Then click the + button below the File table. Here it's the B001R1ZA folder and three Alexa LF MOV files have been added to the job. They now have green dots in the file browser and their parent folders have orange dots showing a partial restore. Choose a folder in the Media browser. Then click the + button below the File browser. The entire ARRIRAW folder has been added to the job. This folder has a green dot in the browser and all the files in that folder have green dots as well. Click the Add Restore Job button. Assuming the tape is online, then a new job will be created. Five ARRIRAW clips and three ProRes movies will be restored. 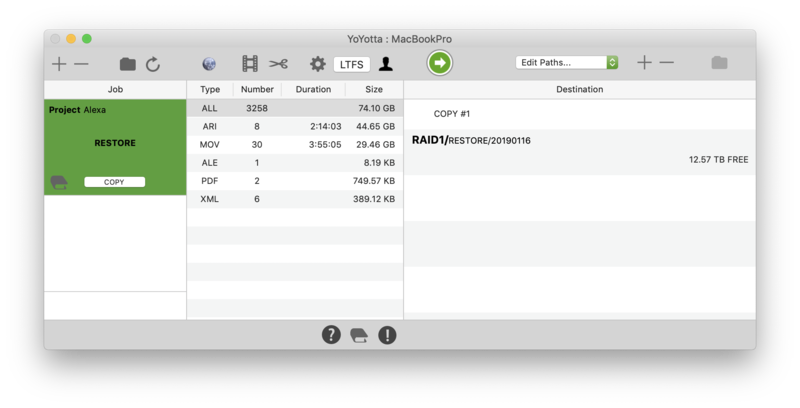 If using YoYotta Automation with an LTO library multiple tapes can be partial restored in a single job. 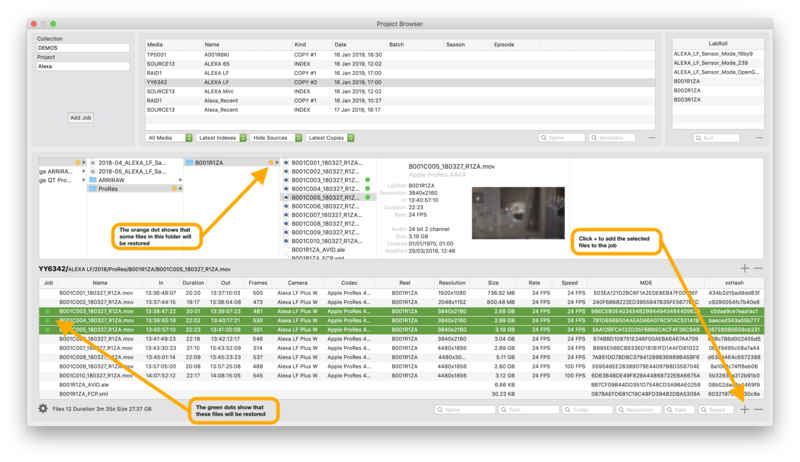 To locate a particular clip select all the snapshots in the Media table. 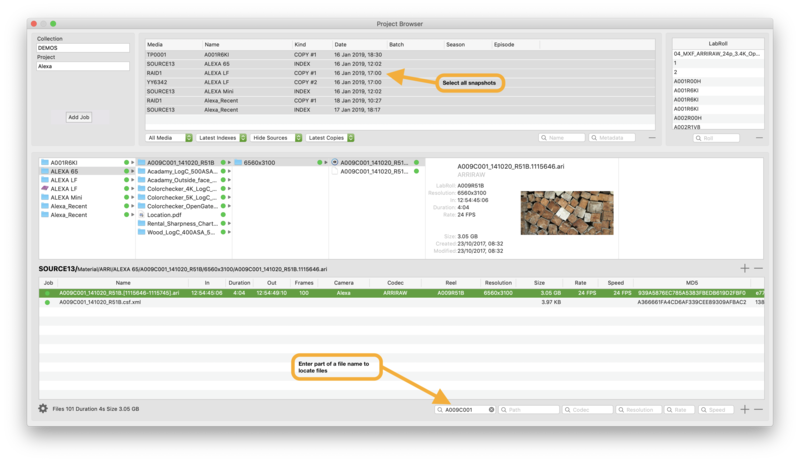 Then type part of a file name, path or codec into the filter boxes below the File table. Selecting the file in the File table will also select the same file in the Media browser. So it's easy to see what drive or tape you will need. The files can then be added to a restore job.